A selection from the vaults of ACD, BEC, and NCN. 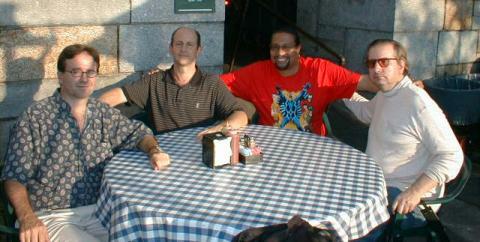 Fab four reunited (from left to right): Soter, Saly, Sinclair, and Doherty, at a reunion in the 1990s. Hidden below street level, these treasures have remained unremarked while a generation has come and gone. Ty Phillips (best known for the Magician of Horror and Mugger) introduces a trio of terror tales. Planet of the Nuns: Voice of Horror – Who Mourns for Lonely Nuns? The Invisible Nun gives testimony and the mysterious Voice of Horror’s identity is revealed. Meanwhile, the students plan another rebellion, this time with a chance of success. Hedwig: Hedwig Zorb. Ruth: Ruth Chas. ACD's signature series. NCN's signature series, a hard-hitting tale of troubled youth. Pilot episode. Taped: 1972, ACD. Alan Saly and Tom Soter in a one-shot murder mystery. Hamilton has a ball with some great guest stars whom no one has probably heard from before or since. Serious drama, featuring Christian Doherty and Alan Saly.